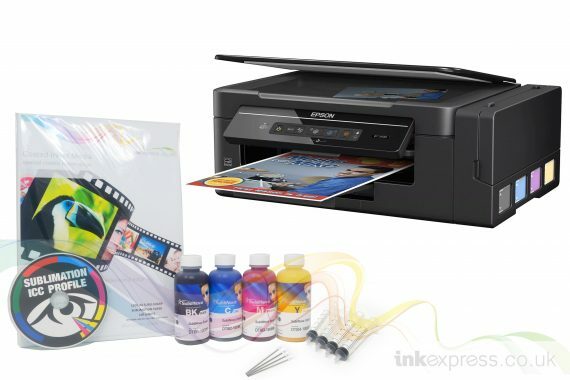 This package includes the Epson Ecotank ET-2600, the ET-2600 is supplied from Epson with one of their Ecotanks fitted. 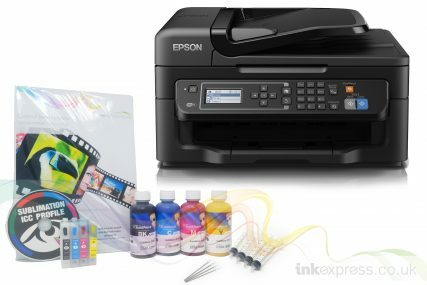 An Ecotank is like a continuous ink system, but rather being fitted by the end user is is supplied like this from Epson. So there is no need to retro fit an ink system to use it with sublimation ink. The ET2600 package is, in our opinion the simplest printer package to invest in for first time sublimationprinters, or customers with worries or concerns about fitting an ink system themselves. With this printer you simply take it out the box, pour in the sublimation ink, setup the drivers on your computer and print.. simple! The printer is a brand new unit and is supplied in its original retail box complete with drivers, software and power lead. *Please note the standard Epson ink bottles have been removed and exchanged with a set of 4 x 100ml Inktec Sublinova Smart Sublimation inks.